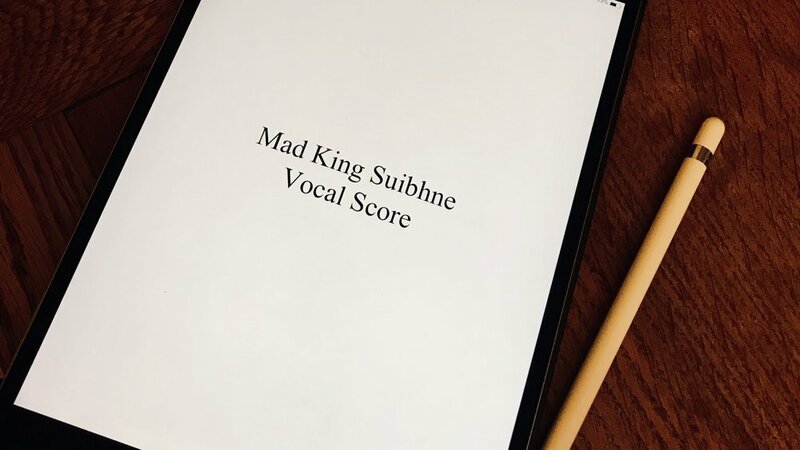 As you've read by now, I've received the amazing news that I'll be singing the title role in a new opera entitled Mad King Suibhne at English National Opera's Lilian Baylis House this November. It's an opera by British composer Noah Mosley, staged by Ella Marchment, both of whom I first met almost two years ago while I was doing Maria de Buenos Aires. I remember that at the time, Noah was in the process of composing this Opera and we talked about it several times and I also got to hear little bits of it and it immediately struck me as genuinely gorgeous music. I'm really happy that things have led to this moment where I get to take over such an amazing role. The libretto of the opera was written by Ivo Mosley and it's based upon the irish legend of Buile Suibhne. To put it briefly, Suibhne was a warrior king driven mad by a curse cast upon him by St. Ronan whom Suibhne bullied. He then descends into madness and a life of wandering around aimlessly, seeking comfort in nature, alienated from all those who try to bring him back to his former existence. The opera mostly follows this plot line, with the difference that what triggers Suibhne's madness is that he believes he murdered a childhood friend. I'm really excited about playing such a psychologically complex character and having witnessed first-hand the impact of dementia in my grandparents' health and autonomy towards the end of their lives, I really want to try and bring this subject to the stage in a truthful and, hopefully, poignant way. Noah's music is absolutely wonderful with a haunting Celtic flavour throughout, bursting into atonal sections when Suibhne has severe episodes of demantia. Nevertheless, there's this melancholy throughout, which in Portuguese we'd describe as 'saudade' and which has everything to do with the suffering that the absence of a loved one causes. Both on Suibhne who deeply misses his wife and has to daily fight off feelings of hopelessness, and also from his wife Eorann (beautifully sung by Isolde Roxby here) who doesn't know where he is or how he is. The score and orchestration perfectly capture this mood and I completely fell in love with it after the first read-through. The shows will be at English National Opera's Lilian Baylis House on November 16th and 17th and tickets can be purchased here. For now, I'm really cherishing this incredible and unexpected birthday gift and also looking forward to working closely again with two amazing colleagues and two of my favourite people work with.